As acacia (Asian Walnut) tree is not likely to Grown up to very tall and with many branches in botanical characters, We supply this hardwood plank floors with normal size 300-1200mm x 120/90mm x 18mm(3/4"x5"),in average length above 600mm but less than 1200mm. Small Leaf Acacia solid wood is strongly characteristic with big contrast in colors,knots,splints ,particular in golden grains,which makes it very attractive to North America Clients. Bronze acacia hardwood flooring and golden solid acacia hardwood plank flooring in smooth and handscraped styles are the best selling mode among all our acacia flooring color designs. 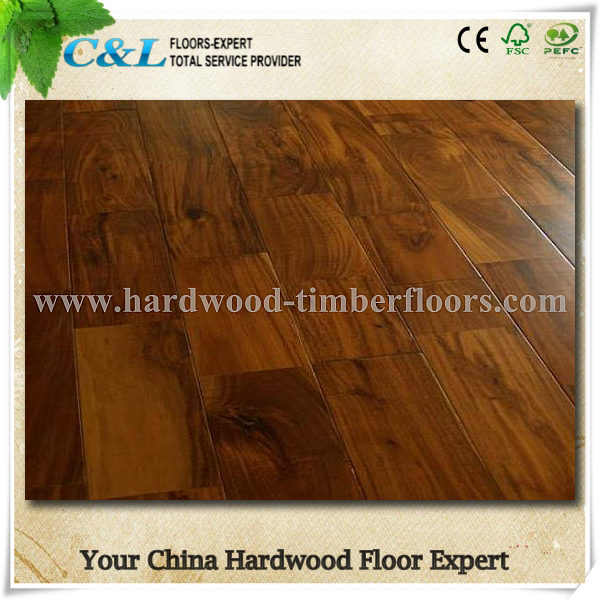 Before purchase,you should be aware of that Pure clear grade Asian walnut(acacia) hardwood floors is very difficult to find in Bulk quantities,most of them comes with AB/ABC GRADE with strong wood characters. Choose C&L hardwood bronze golden acacia hardwood flooring,make your room fantastic in views!